For other uses, see Manu. Manu (Sanskrit: मनु) is a term found with various meanings in Hinduism. In early texts, it refers to the archetypal man, or to the first man (progenitor of humanity).The Sanskrit term for 'human', मानव (IAST: mānava) means 'of Manu' or 'children of Manu'. In later texts, Manu is the title or name of fourteen mystical Kshatriya rulers of earth, or alternatively as the head of mythical dynasties that begin with each cyclic kalpa (aeon) when the universe is born anew. The title of the text Manusmriti uses this term as a prefix, but refers to the first Manu – Svayambhuva, the spiritual son of Brahma. In some Puranic mythology, each kalpa consists of fourteen Manvantaras, and each Manvantara is headed by a different Manu. The current universe, in this mythology, is asserted to be ruled by the 7th Manu named Vaivasvata. In Vishnu Purana, Vaivasvata, also known as Sraddhadeva or Satyavrata, was the king of Dravida before the great flood. 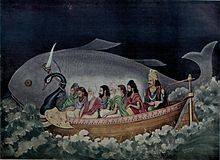 He was warned of the flood by the Matsya (fish) avatar of Vishnu, and built a boat that carried the Vedas, Manu's family and the seven sages to safety, helped by Matsya. The myth is repeated with variations in other texts, including the Mahabharata and a few other Puranas. It is similar to other flood myths such as that of Gilgamesh and Noah. In this Manvantara, the Saptarshis were Marichi, Atri, Angiras, Pulaha, Kratu, Pulastya, and Vashishtha. In Svayambhuva-manvantara, Lord Vishnu's avatar was called Yajna. The first Manu was Svayambhuva Manu. He had three daughters, namely Akuti, Devahuti and Prasuti. Devahuti was given in marriage to sage Kardama and she gave birth to nine daughters, and a single son named Kapila. Prasuti gave birth to Yajna and Akuti gave birth to one son and one daughter. Both Kapila and Yajna, who were sons of Devahuti and Prasuti respectively, were incarnations of Vishnu. Svayambhuva Manu, along with his wife, Satarupa, went into the forest to practice austerities on the bank of the River Sunanda. At some point in time, Rakshasas attacked them, but Yajna, accompanied by his sons, the demigods, swiftly killed them. Then Yajna personally took the post of Indra, the King of the heavenly planets. The Saptarshis were Urjastambha, Agni, Prana, Danti, Rishabha, Nischara, and Charvarivan. In Svarocisha-manvantara, Lord Vishnu's avatar was called Vibhu. The second Manu, whose name was Svarocisha, was the son of Agni, and His sons were headed by Dyumat, Sushena and Rochishmat. In the age of this Manu, Rochana became Indra, the ruler of the heavenly planets, and there were many demigods, headed by Tushita. There were also many saintly persons, such as Urjastambha. Among them was Vedasira, whose wife, Tushita, gave birth to Vibhu. Vibhu was the incarnation of Vishnu for this Manvantara. He remained a Brahmachari all his life and never married. He instructed eighty-eight thousand dridha-vratas, or saintly persons, on sense-control and austerity. The Saptarshis for this Manvantara were Kaukundihi, Kurundi, Dalaya, Sankha, Pravahita, Mita, and Sammita. In Uttama-manvantara, Lord Vishnu's avatar was called Satyasena. Uttama, the son of Priyavrata, was the third Manu. Among his sons were Pavana, Srinjaya and Yajnahotra. During the reign of this Manu, the sons of Vashista, headed by Pramada, became the seven saintly persons. The Satyas, Devasrutas and Bhadras became the demigods, and Satyajit became Indra. From the womb of Sunrita, the wife of Dharma, the Supreme Lord Narayana appeared as Satyasena, and killed all the evil Rakshasas who created havoc in all the worlds, along with Satyajit, who was Indra at that time. Saptarshis list: Jyotirdhama, Prithu, Kavya, Chaitra, Agni, Vanaka, and Pivara. In Tapasa-manvantara, Lord Vishnu's avatar was called Hari. Tapasa/Tamasa, the brother of the third Manu, was the fourth Manu, and he had ten sons, including Prithu, Khyati, Nara and Ketu. During his reign, the Satyakas, Haris, Viras and others were demigods, the seven great saints were headed by Jyotirdhama, and Trisikha became Indra. Harimedha begot a son named Hari, who was the incarnation of Vishnu for this Manvantara, by his wife Harini. Hari was born to liberate the devotee Gajendra. Saptarshis list: Hirannyaroma, Vedasrí, Urddhabahu, Vedabahu, Sudhaman, Parjanya, and Mahámuni. In Raivata-manvantara, Lord Vishnu's avatar was called Vaikuntha, not to be confused with Vishnu’s divine realm, of the same name. Vaikuntha came as Raivata Manu, the twin brother of Tamasa. His sons were headed by Arjuna, Bali and Vindhya. Among the demigods were the Bhutarayas, and among the seven brahmanas who occupied the seven planets were Hiranyaroma, Vedasira and Urdhvabahu. Saptarshis list: Sumedhas, Virajas, Havishmat, Uttama, Madhu, Abhináman, and Sahishnnu. In Chakshusha-manvantara, Lord Vishnu's avatar was called Ajita. Ajita came as Chakshsusa Manu, the son of the demigod Chakshu. He had many sons, headed by Puru, Purusa and Sudyumna. During the reign of Chakshusa Manu, the King of heaven was known as Mantradruma. Among the demigods were the Apyas, and among the great sages were Havisman and Viraka. The seventh Manu, who is the son of Vivasvan, is known as Sraddhadeva(or satyavrata ) or Vaivasvat(son of Vivasvan). He has ten sons, named Ikshvaku, Nabhaga, Dhrsta, Saryati, Narisyanta, Dista, Tarusa, Prsadhra and Vasuman. In this manvantara, or reign of Manu, among the demigods are the Adityas, Vasus, Rudras, Visvedevas, Maruts, Asvini-kumaras and Rbhus. The king of heaven, Indra, is known as Purandara, and the seven sages are known as Kashyapa, Atri, Vashista, Angira, Gautama, Agastya and Bharadwaja. During this period of Manu, Lord Vishnu took birth from the womb of Aditi, the wife of Kashyapa. Saptarshis list: Diptimat, Galava, Parasurama, Kripa, Drauni or Ashwatthama, Vyasa, and Rishyasringa. In Savarnya-manvantara, Lord Vishnu's avatar will be called Sarvabhauma. In the period of the eighth Manu, the Manu is Surya Savarnika Manu. His sons are headed by Nirmoka, and among the demigods are the Sutapas. Bali, the son of Virochana, is Indra, and Galava and Parasurama are among the seven sages. In the age of this Manu, Lord Vishnu's avatar will be called Sarvabhauma, the son of Devaguhya and Sarasvati. Saptarshis list: Savana, Dyutimat, Bhavya, Vasu, Medhatithi, Jyotishmán, and Satya. In Daksha-savarnya-manvantara, Lord Vishnu's avatar will be called Rishabha. The ninth Manu is Daksha-savarni. His sons are headed by Bhutaketu, and among the demigods are the Maricigarbhas. Adbhuta is Indra, and among the seven sages is Dyutiman. Rishabha would be born of Ayushman and Ambudhara. Saptarshis list: Havishmán, Sukriti, Satya, Apámmúrtti, Nábhága, Apratimaujas, and Satyaket. In Brahma-savarnya-manvantara, Lord Vishnu's avatar will be called Vishvaksena. In the period of the tenth Manu, the Manu is Brahma-savarni. Among his sons is Bhurishena, and the seven sages are Havishman and others. Among the demigods are the Suvasanas, and Sambhu is Indra. Vishvaksena would be a friend of Sambhu and will be born from the womb of Vishuci in the house of a brahmana named Visvasrashta. Saptarshis list: Niśchara, Agnitejas, Vapushmán, Vishńu, Áruni, Havishmán, and Anagha. In Dharma-savarnya-manvantara, Lord Vishnu's avatar will be called Dharmasetu. In the period of the eleventh Manu, the Manu is Dharma-savarni, who has ten sons, headed by Satyadharma. Among the demigods are the Vihangamas, Indra is known as Vaidhrita, and the seven sages are Aruna and others. Dharmasetu will be born of Vaidhrita and Aryaka. Saptarshis list: Tapaswí, Sutapas, Tapomúrtti, Taporati, Tapodhriti, Tapodyuti, and Tapodhan. In Rudra-savarnya-manvantara, Lord Vishnu's avatar will be called Sudhama. In the period of the twelfth Manu, the Manu is Rudra-savarni, whose sons are headed by Devavan. The demigods are the Haritas and others, Indra is Ritadhama, and the seven sages are Tapomurti and others. Sudhama, or Svadhama, who will be born from the womb of Sunrita, wife of a Satyasaha. Saptarshis list: Nirmoha, Tatwadersín, Nishprakampa, Nirutsuka, Dhritimat, Avyaya, and Sutapas. In Deva-savarnya-manvantara, Lord Vishnu's avatar will be called Yogeshwara. In the period of the thirteenth Manu, the Manu is Deva-savarni. Among his sons is Chitrasena, the demigods are the Sukarmas and others, Indra is Divaspati, and Nirmoka is among the sages. Yogeshwara will be born of Devahotra and Brihati. Saptarshis list: Agnibáhu, Śuchi, Śhukra, Magadhá, Gridhra, Yukta, and Ajita. In Indra-savarnya-manvantara, Lord Vishnu's avatar will be called Brihadbhanu. In the period of the fourteenth Manu, the Manu is Indra-savarni. Among his sons are Uru and Gambhira, the demigods are the Pavitras and others, Indra is Suci, and among the sages are Agni and Bahu. Brihadbhanu will be born of Satrayana from the womb of Vitana. Almost all literature refers to the first 9 Manus with the same names but there is a lot of disagreement on names after that, although all of them agree with a total of 14. The texts ascribed to the Svayambhuva Manu include Manava Grihyasutra, Manava Sulbasutra and Manava Dharmashastra (Manusmṛti or "rules of Manu"). Jain mythology mentions the 14th patriarch named Nabhiraja, mentioning him also as Manu. This, state scholars, links ancient Jain tradition to Hindu mythologies, because the 14 patriarchs in Jain myths are similar to the 14 Manus in Hindu myths. The Manu of Jainism is the father of 1st Tirthankara Rishabhanatha (Adinatha). This ancient story is significant as it includes one of earliest mentions of ikshu (sugarcane) processing. In the Victor Hugo novel, The Hunchback of Notre Dame, Claude Frollo is seen to be studying Manu's works in his study of alchemy. Minos, king of Crete, son of Zeus and Europa. Mannus, progenitor of humanity in Germanic mythology according to Tacitus. Nu'u, Hawaiian mythological character who built an ark and escaped a Great Flood. Nüwa, goddess in Chinese mythology best known for creating mankind. ^ a b c Roshen Dalal (2010). Hinduism: An Alphabetical Guide. Penguin Books. p. 242. ISBN 978-0-14-341421-6. ^ a b Roshen Dalal (2010). The Religions of India: A Concise Guide to Nine Major Faiths. Penguin Books. p. 229. ISBN 978-0-14-341517-6. ^ Alain Daniélou (11 February 2003). A Brief History of India. Inner Traditions / Bear & Co. pp. 19–. ISBN 978-1-59477-794-3. ^ Klaus K. Klostermaier (5 July 2007). A Survey of Hinduism: Third Edition. SUNY Press. p. 97. ISBN 978-0-7914-7082-4. ^ His Divine Grace A. C. Bhaktivedanta Swami Prabhupada. Teachings of Lord Caitanya (Third Edition): The Golden Avatara. The Bhaktivedanta Book Trust. pp. 109\u2013. ISBN 978-91-7149-730-7. ^ a b Inhabitants of the Worlds Mahanirvana Tantra, translated by Arthur Avalon, (Sir John Woodroffe), 1913, Introduction and Preface. The Rishi are seers who know, and by their knowledge are the makers of shastra and "see" all mantras. The word comes from the root rish Rishati-prapnoti sarvvang mantrang jnanena pashyati sangsaraparangva, etc. The seven great Rishi or saptarshi of the first manvantara are Marichi, Atri, Angiras, Pulaha, Kratu, Pulastya, and Vashista. In other manvantara there are other saptarshi. In the present manvantara the seven are Kashyapa, Atri, Vashista, Vishvamitra, Gautama, Jamadagni, Bharadvaja. To the Rishi the Vedas were revealed. Vyasa taught the Rigveda so revealed to Paila, the Yajurveda to Vaishampayana, the Samaveda to Jaimini, Atharvaveda to Samantu, and Itihasa and Purana to Suta. The three chief classes of Rishi are the Brahmarshi, born of the mind of Brahma, the Devarshi of lower rank, and Kings who became Rishis through their knowledge and austerities, such as Janaka, Ritaparna, etc. The Shrutarshi are makers of Shastras, as Sushruta. The Kandarshi are of the Karmakanda, such as Jaimini. ^ The Laws of Manu. See 63: These seven very glorious Manus, the first among whom is Svayambhuva, produced and protected this whole movable and immovable (creation), each during the period (allotted to him). ^ a b c d Natubhai Shah 2004, pp. 15–16.